I absolutely love this, Jo-Lynne. The jeans are such a gorgeous color. If I hadn’t just picked up a sage-y colored pair recently, I’d 100% percent be spending the rest of my bday gift card on these! The top pairs beautifully with them (did you happen to see WHBM is now with shoprunner??). Unrelated, but my Millers came in yesterday. They. Are. Perfect. I’m wondering if light makeup is the same as makeup now? They’re exactly *exactly* the color I was picturing for makeup. Either way, they are gorgeous! Thanks for the reassurance! Love this look. Happy Spring! I luv your blog. It has renewed my interest in fashion. At 45 I needed a major clothing makeover. I know your looking forward to your trip here to Fl, just a weather update from Central FL, its in the 50-60″s in the mornings, the thunderstorms are holding off until this weekend and the highs are in the 80’s. You never did say where in Fl you are coming to. Cute sweater – love the jeans color too! Cute sweater. It’s so versatile! The new jewelry is pretty. Have fun in Florida! Love this! I have wondered about my mint green jeans. Maybe I’ll hang onto them another year, but live this new shade better! Love the jewelry and I just “liked” them on Facebook. And….I think navy would be beautiful with these pants! Love those mint pants! The jewelry is very nice. Perhaps an idea for a post would be to discuss these “large” earrings that are trending, and how they might work with short hair. Love this new line of jewelry! Pink is so cute and such a great neutral. One of my favorite colors. Great spring outfit! Love Love your necklace! Have fun in Vero, I’m in Melbourne, the weather is great right now! Visited the Alison and Aubrey site. Thank you for sharing. I love the white shirt, a new take on a plain color. Not to sure about the color of the pants. That might be something I have to see in person before I can make a final decision. I think the agave jeans would look great paired with navy and coral! A great new twist on the minty trend. The jewelry is very pretty. Have a great time in Florida! Loved the jewelry, especially the necklace. Love the jeans color. All so pretty. Love the Agave color. What about wearing navy blue with them?? Have fun on your trip! Love checking in everyday and getting great ideas!!! Such a nice color on the jeans! Besides cream, I think navy, taupe, coral or pink would be pretty. And printed or stripes. Have a great time in FL with your girlfriends! You look great. Have fun on your trip! I love the color of the jeans. I’m like you and tend to pair neutrals with colored pants. I need to branch out!! Cute jewelry!! Such a pretty outfit! Have a wonderful weekend! LOVE the blush tassel earrings. A bit understated, but still make a statement. Thanks for the opportunity! Love this color comb and those pants are perfect for spring. But I where petite pants and not sure the ankle length would be short enough ? Also agree that the next size up in both would work best but like me I am stuck on ordering a medium when I should get a small, but I need a bit more room for the girls but then my daughter always makes a comment about my tops looking too big 😟 I may have to start ordering both and then returning one to be sure. Thanks for the give away. The jewelry is beautiful. Safe travels! Cute jewels! How about rose color top with agave jeans? Thinking of moving?? Can’t wait to hear all about it! because I feel like I’m bigger on top and in the middle than on bottom, I like to wear darker colors on top and lighter colors on the bottom. I love the agave jeans, and for me I was thinking navy would be beautiful with them—or even periwinkle, rose, or charcoal gray. I wear navy all of the time with my mint green jeans. I also wear navy with blush. This is such a cute outfit! Love everything about it. I can see the jeans with a floral top also. I have the perfect one. Ha. Have a great time with the girls. Nothing like a girl weekend with friends. You sure deserve one. Enjoy. I really like that agave color of jeans! The mint color doesn’t appeal to me as I don’t think I look great in pastels, but that dusty color is just gorgeous. As always your outfit looks great! Love your style and the jewelry is beautiful! This is a very classy look! Love the sage. Thanks for hosting such a great giveaway! I love Alison’s style and her new jewelry line is so sweet! I didn’t ever get mint jeans, but I do have mint ankle pants. I love to wear them with white and ivory. But also with navy and black. Such a cute outfit! Bring on spring! Great outfit Jo-Lynne! I can relate to the house hunting. A few years ago we spent a year and a half looking and when our realtor suggested looking outside our area, we thought – ok why not. Well, I found my dream house on the opposite end of the city! It was a big move for my boys, as one was starting Jr High and one in High School. But we all survived and are loving the new place. I think you should try a pink or dusty rose colored top with the agave pants. Have a great day! Yeah, we don’t want to move that far from our friends, although we are on one edge of the school district, and we could potentially expand our search, but it would put Paul farther from work, and I really want to stay near friends. So… we shall see. If nothing comes along, we are happy here. I like wearing navy tops with mint pants. I just bought some mint jeans and LOVE them! I do love how the earrings go with. Beautiful outfit! Love this outfit! I always love your sweaters, but can’t wear many of them as I live in Southern CA. This one, though, I can do! I think those jeans would look great with a floral blouse in pastels, with a denim jacket over it. Or a top in deep rose – one of my fave colors for this spring. I love to rock navy blue and grey with mint green pants. I think you could do both those colors with the agave pants, especially if the navy shirt also had some agave in the print. I think Blush would also work with the agave. Go for it girl! First off, a million billion thanks for supporting Aubrey and me in our new venture! We are in love with how you styled this pieces and appreciate it so much. Secondly I’m kind of obsessed with that color. I had a pair of cords that color this winter and it literally goes with everything. I think a darker color would look nice. A darker green would give a monotone look and balance the body. Navy would look smashing, too! Any print with the green in it would be pretty. I pair black with everything. It gives a girly color some sophistication. So glad to hear that mint jeans are still current —I still have mine! Also, I have a bracelet from Alison and Aubrey and really like it! I love reading your blog every day. Thanks for continuing to do a great job reaching women. Thank you Jo-Lynne for this opportunity! I love your blog and the new line of jewelry! Love these jeans and are so tempted them to add them to my wardrobe. They look so fresh and neutral. I bet they would look lovely with navy too! I love this outfit! I really need to try more colored jeans. Have a really fun trip! I love the sandals! I haven’t seen the agave color but looks like a nice change from the mint. I like the muted colors. I love the color of these jeans. Wow! The necklace and earrings look good together! Love seeing what cute outfits you put together! I always loved navy with my mint pants too- I think that would go well with this color also! Have so much fun here in Florida! Should be really warm, but not too humid yet. Love that color of pants – it’s the perfect t amount of color. The top is very pretty. Is it very thick? I live in Texas and I’m wondering if it will be too hot here for that material. Conversely, I can’t tell if you need to wear a cami with it either. I know you’re excited about your girls weekend. Have a great time! It’s not super thick, but it’s a nice weight so it’s not see-through. I love the color of these pants and the jewelery goes very nice with it. The earrings and necklace are absolutely beautiful!!! Can’t wait to see what else they have available!!! I would pair the agave or mint pants with navy. My favorite is blouse that is creamy or white with navy polka dots. Great one at Loft now. Have a fun weekend trip. Please share pictures later for those of us without Facebook or Instagram. The A & A jewelry looks beautiful with your outfit! I really enjoy your blog. You are one of my favorites. I look forward to reading your posts daily. I love your realness. Keep doing you. Also I love the Allison+Aubrey line of jewelry. Love your look today. Would love to win the beautiful jewelry. I love the pale color of the jeans w the ivory sweater – great color combo! I absolutely love that necklace! I hope I’m the winner! Love the new jewelry! Hope you enjoy your Florida get away! I still love my mint jeans, but these are a nice variation on the mint idea. I always wanted to get some colored jeans but didn’t jump the mint trend but these are really pretty. I love the more subtle look. Thanks for the idea! Love the top. I think the pants are a pretty color but think you could use a larger size. They look tight & the top looks a little small.not meaning to be too critical. Also think you need to show less pricey items. Some of us can’t afford the things you buy. Your husband must make a good salary for all the clothes, mani pedis, etc that you buy. She runs a successful business and part of the cost of doing business is looking good in the photo shoots. I think mani/pedi’s and quality clothing are part of the job description. I bet she is self-supporting and the statement about her husband is really demeaning to women. I do think she has a good mix of higher cost (timeless and quality) and lower cost items. I love the $15 old navy dress I picked up! And she has really helped me to step up my fashion game and spend thoughtfully. Thanks for helping us “forty something moms” stay on trend!!! You always look so pretty! Love your fashion advice! How fun to get some new jewelry from Allison and Aubrey’s new line. Isn’t it funny how you tend to style some things (like agave jeans) with the same color every time? I was thinking black would look good with them too or maybe even gray? Not really sure if they might be too close tonal wise. I bet you could put chambray with them too. If I knew y’all were looking for a house, I already forgot…lol. It’s a big decision and exciting too. I remember looking at houses with my parents when I was a kid and getting excited too. Good luck with whatever the future holds on that one. 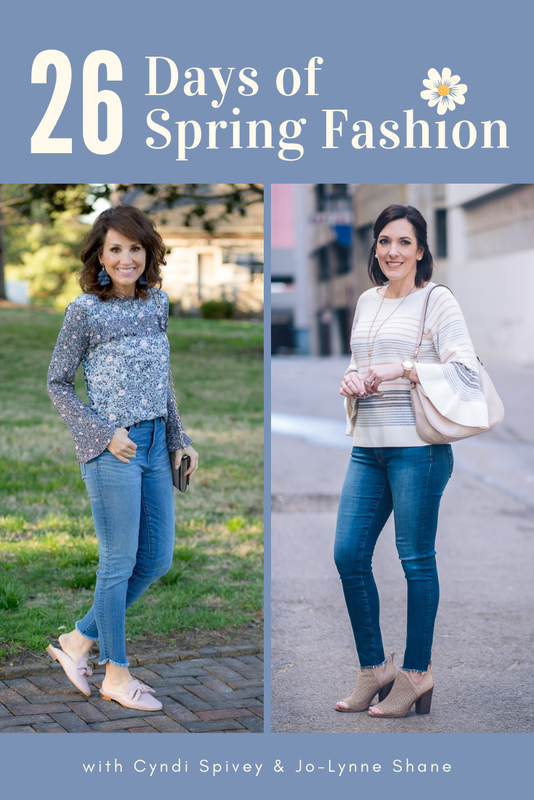 Loving these spring styles. Now if the weather would just Co-operate where we could hear some. Thanks for all you do. I love the A&A earrings! I always enjoy your posts! Enjoy the warm spring temps we are finally getting!! This new jewelry line is adorable. I looked at several other pieces, and I can see many of them fitting in to my existing wardrobe. Those jeans are a super cute color and I would like to see more! Love that top! Wish it came in more colors though. Saw a rose color on WHBM too, but too pale for me! I love their jewelry line! And it looks great to see their jewelry paired up with the outfit on your blog! Love to read your blog every day! I have a pair of sage green pants and need to figure out what to wear with them. The top you have on looks perfect! The sweater is so cute. I love the whole look! I follow Allison’s blog but have just recently checked out her jewelry website. I was thinking of ordering these exact pieces! It would be so awesome to win! I love the simplicity of the necklace and the earrings would be a fun addition to a summer outfit. I follow Alison’s blog but just recently checked out the website for her and Aubrey’s jewelry. I have been thinking about ordering these exact pieces. How awesome would it be to win?!? Sorry….I didn’t realize my first comment had posted so I posted again. Whoops. I love those pants & shoes!! Those blush earrings are gorgeous with the sage jeans. What a great color combo! Love the outfit you put together! Those earrings are gorgeous!!! Such a pretty top – and I love the necklace! Cute earrings! I’m crazy about accessories and love fun earrings and necklaces. Love the outfit and how the jewelery shines with it. You should wear statement earrings more often, they look great on you. Thank you so much for offering this awesome giveaway! The necklace is just gorgeous! Thanks for the chance to win these beautiful items! I love them. This is a beautiful look. It is classy yet comfy. I can definitely use the Alison + Aubrey Vivie Fringe Fan Earrings in Blush and the Alexis Layered Oval Tassel Necklace and put together a unique maxi dress outfit with a pair of Espadrille Wedges. Next Post » C’est La Vie!